Bill Smith, ARRA Editor: As William Warren rightly depicted, David Letterman made the number 1 spot on the Top 10 of the Washed-Up Lefty Hacks. At 62, Letterman appears bored with himself and for some reason seems fixated on attacking conservatives, especially women and in this case a 14 year old girl. Letterman tried to weasel out of his inappropriate joke about Sarah Palin's 14 year old daughter being raped by a "here-in unnamed" baseball player. However, Letterman's apology fell far short of an "I'm sorry" or "I was wrong." If Letterman had been a conservative the networks and press would have demanded that he be fired but that doesn't seem to work over at the "unfair and unbalanced" CBS Network. While conservative commentators have condemned Letterman, few conservative political figures have stepped forward to publicly side with Sarah Palin. This means they either fear Letterman, which is doubtful, or maybe they are secretly cheering for the downfall of Palin who can draw out larger crowds to hear her speak than any of the other politicians who might be contenders against her in 2012 if she decides to run for the presidency. I condemn Letterman's remarks. Wendy Wright, president of Concerned Women for America, told Fox News that the talk show host's jokes about the former Vice Presidential candidate were "reprehensible" and "a pretty ugly reflection of who Letterman may be." It is time for Letterman to retire to his 108 acre estate and work on his attitude and ability to be a decent father and husband rather than an aging perverted comic. Tags: David Letterman, jokes, Late Show, leftist, political cartoon, Sarah Palin, Top 10 Reasons, William Warren To share or post to your site, click on "Post Link". Please mention / link to the ARRA News Service. Thanks! Sarah Palin (the Barracuda) showed how effective she can be when she’s comfortable during an interview. She clearly delienated that Alaska can and is willing to help cut energy cost of Americans and touted "her triumph in bringing Exxon on board to help build Alaska’s ambitious new natural-gas pipeline." Hot Air credits "Blitzer and CNN for giving her an opportunity to talk policy at length; the obligatory questions about the Letterman trainwreck don’t come until the very end, after an extended discussion of energy and an elaboration on what she meant when she said the tentacles of federal aid to the states will lead to 'controlling the people.'" Consider the arguements by some who are not at all concerned with easing the burden on America and are criticizing Alaska's ability to deliver cheaper natural gas to the continuous 48 states. Obviously Sarah "Barracuda " is not following Obama's plan for national servitude. Tags: Alaska, Barracuda, CNN, energy independence, natural gas, pipeline, Sarah Palin, videos To share or post to your site, click on "Post Link". Please mention / link to the ARRA News Service. Thanks! by George F. Will: "We," said Queen Victoria, employing the royal plural, "are not amused." "We," said the Treasury Department on Tuesday, relishing the royal prerogatives it exercises nowadays, "are gratified that not a single court that reviewed this matter, including the U.S. Supreme, found any fault whatsoever with the handling of this matter by either Chrysler or the U.S. government." Is it lese-majeste to note that Treasury is being misleading? At issue was the government's rush to push the remnants of Chrysler through bankruptcy and into marriage with Fiat, the Italian company that is now yet another business subsidized by U.S. taxpayers. But as the court said in its order permitting completion of Chrysler's bankruptcy, its refusal to review what lower courts have authorized "is not a decision on the underlying legal issues" and pertains to "this case alone." That matters because the more complex and consequential General Motors bankruptcy is not completed, . . . Chrysler was a "guinea pig" on which the government tested what it can get away with in GM's bankruptcy, which involves the same issues: Is it lawful to use Troubled Assets Relief Program (TARP) funds for this? Does the mistreatment of Chrysler's secured creditors constitute an unconstitutional taking of property? Richard Mourdock, the Indiana state treasurer who has been criticized for contesting the terms of the Chrysler bailout, notes that "no critic has ever challenged us on the points of law." Indiana's pension funds for retired teachers and state police officers were among Chrysler's secured creditors. It has been settled law that secured creditors, as compensation for lending money at rates lower than the borrowing company's condition might justify, are first in line to be paid in the event of bankruptcy. Indiana's funds and other secured creditors received less per dollar than did an unsecured creditor, the United Auto Workers, which also got 55 percent ownership of Chrysler. So the government is simultaneously subsidizing Italians and injuring retired Hoosiers. . . . Controversy about the judiciary's proper role is again at a boil because of a Supreme Court vacancy, and conservatives are warning against "judicial activism." But the Chrysler and GM bailouts and bankruptcies are reasons for conservatives to rethink the usefulness of that phrase and to make some distinctions. Tags: bailout, bankruptcy, Chrysler, Fiat, property rights, SCOTUS, US Supreme Court To share or post to your site, click on "Post Link". Please mention / link to the ARRA News Service. Thanks! Updates: Moe Lane at Red State said: [Berry's] been in Congress since 1997, which is certainly enough time to learn that ethics rules require that Congressmen are expected to not hide their actual net worth . . . Berry reported his house’s value as being within a range, which is specifically prohibited. Also, Berry rents out the residence for income, which means that he was really supposed to report its full value. I’d say that this was a case of Beltway Disease, except that he has a history that apparently predates his moving to Washington, DC. Arkansas Republican Party Chairman Doyle Webb: "It's upsetting to see another misleading act come out of the Beltway. If a Washington insider like Marion Berry can continue to mislead his constituents on things as simple as this, what can we expect from him on issues that are critical to Arkansas families here at home?" by Paul Singer, Roll Call* (June 11, 2009): Rep. Marion Berry (D-Ark.) appears to have understated by hundreds of thousands of dollars the value of his Capitol Hill rowhouse on his annual financial disclosure forms. In May, Berry filed a financial disclosure form reporting the value of the house at between $250,000 and $500,000, the same value that he has listed on his disclosure forms each year. But according to District of Columbia tax records, the current assessed value of the house is $947,080, and the proposed 2010 assessment value is $864,970, reflecting the drop in Capitol Hill property values. Berry and his wife bought the house in 1999 for $369,000, but the rules for reporting property values on disclosure forms clearly state that the filer is to use "fair market value." If that value is unavailable, the filer may report the purchase price or the assessed value for tax purposes, but in those cases, the filer is required to report an exact amount, not a range, and to disclose which method is being used to determine the value. Berry's form offers no indication of how he is setting the value. Members do not have to disclose the value of their homes if they are for personal use only; Berry rents the house and receives between $15,000 and $50,000 a year in income. When a house produces rental income, the House Ethics Manual explains that the value of the entire home must be reported, not simply the value of the rental unit. Last year, Roll Call reported that ex-Rep. Joe Knollenberg (R-MI) had made the same error on his disclosure forms, and dozens of other Members - including then-Sen. Barack Obama - had filed disclosure forms with other mistakes and omissions. Berry has also reported for years owning a property on Main Street in Gillett, Ark., with a value of less than $1,000. Berry's office was unable to explain the apparent errors on his form. *Roll Call is a subscription service. The above copy was provided by the RPA. Tags: Arkansas, Ethics, financial disclosure, Marion Berry, Representative, Roll Call, US House To share or post to your site, click on "Post Link". Please mention / link to the ARRA News Service. Thanks! Wow, look at her go. Michelle Obama, who was in London on a short sightseeing trip with her daughters, didn’t let the small issue of a failing government stand in the way of her sunny style. While the men around her look to be in mourning, Mrs O stands out like a beacon against the night sky. Ok, the appliquéd tunic has the air of Malia or Sasha’s art class about it and sure, it does nothing for her hips – all that extra fluff and detail around the middle adds bulk to her usually smooth lines. But when did looking trim become part of a visit to Westminster Abbey? From a fashion purist’s perspective, the colours are bang on the money. Designers have been consumed with Post-it note yellow, flamingo and tangerine for the past season or so . . . Wide stripes sound like a neurotic fashion no-no, but again the First Lady knows exactly what she is doing. . . . Mrs O is a clever woman: pretending to have just thrown on any old holiday number whilst actually acknowledging pioneering catwalk ideas is no mean feat. . . . Unfortunately, those three-dimensional flowers, that strange orange snake working its way around her middle and the yellow curtain pelmet are impossible to defend. As a stack, they look like one of those modern, fancy wedding cakes that brides’ co-ordinate with their flowers. For a woman who established her look on the principles of sophistication and elegance, the detailing is just a bit too sugary. And the spotted plastic belt? . . . So, this outfit isn’t 100 per cent faultless, but at least the First Lady has the confidence to have fun with what she wears. It takes a brave woman to wear pink daisies. And bloggers rejoice, her arms are covered too. 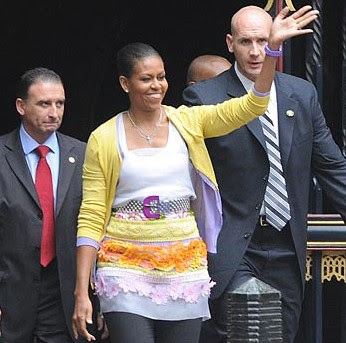 Tags: clothes, London, Michelle Obama, Westminster To share or post to your site, click on "Post Link". Please mention / link to the ARRA News Service. Thanks! The newly formed [New York] Senate Coalition Government passed numerous reforms after the bipartisan group assumed control in the New York State Senate. . . . Despite having to work in the dark after Senate Dems turned off the lights in the Senate chamber (are you freakin kidding me?) and having the public shut out when the Senate session broadcast was unceremoniously turned off, the new coalition passed many reforms never before seen in state government. Here are just a few. The Senate shall be administered in a fair, equitable and nonpartisan manner. Committee Chairs and Rankers are term-limited to 8 years. Committee membership will be proportional to membership in the Senate as a whole. Minority representation shall not be less than 33% on any committee. (Eff. 7/15/09). Proxy voting in committee is eliminated. Eliminates "aye without recommendation" members must either vote nay or aye on a bill, unless they abstain due to a pecuniary interest. All agendas and voting records will be published on the Senate Website; all committee meetings recorded and webcast. A plan will be put forward by January 1, 2010 to create NY-SPAN statewide broadcast of legislative proceedings similar to C-SPAN for Congress. No bill may be introduced without a named Senate sponsor. All members will have access to the resources and services of the Senate: supplies, print and media production, administrative services, and mailing. District office allocations are based on the geographic area; larger districts will be allowed a satellite office(s) to meet the needs of their constituents. All members will receive the same base allocation for staffing. Committees and Leadership will receive an allocation for staffing pursuant to a resolution which will detail the amounts allocated for each committee or position. Amounts shall be proportional among majority and minority members to representation in the Senate as a whole, but in no event shall it be less than 33% for the Minority. Central Staff funding shall be allocated on a proportional basis, but in no event less than 33% of the funds shall be allocated to the minority. Staff necessary to the functions of the Senate are not to be included in the proportional distribution. Member items will be divided evenly.
. . . Meanwhile, the shady Working Families Party, formerly run by labor groups and now known to have affiliations with the voter fraud organization ACORN, immediately interjected themselves into the fray and strongly condemned these and any other Democrats who might consider working together with Republicans for better government in New York State. . . .
ACORN/Working Families Party have now lost their perceived power in the NYS state legislature because it is no longer under total control by Democrats who passed the worst budget in the history of New York state. And just where was their support of already overtaxed low-to moderate income families when the budget passed by Democrats included tax increases? Can you see the parallels now? ACORN, The Web of Corruption, endorsed Obama for president, worked for his campaign, committed voter fraud in 14 states, all to solidify their power base in DC, just like in New York state. The New York state senate has spoken. If only our “representatives and senators” would make the same changes in DC, literally clearing house of all the ACORN spider webs and its cronies. Tags: ACORN, New York, reform rules, Senate, web of corruption To share or post to your site, click on "Post Link". Please mention / link to the ARRA News Service. Thanks! Corruption is ACORN - Watch This Video! Americans for Limited Government today released a new video, "Corruption is ACORN" featuring three exclusive congressional interviews calling for ACORN to be defunded after having been charged with fraudulent voter registration in 17 states. "ACORN is essentially a massive crime family," Capital Research Center ACORN Investigator Matthew Vadum charges in the video. And the sentiments are backed by searing quotes from Representative Michele Bachmann (R-MN) and Steve King (R-IA), and Sen. David Vitter (R-LA). "Congress without hesitation has continued to fund a criminal enterprise," added Bill Wilson, ALG Director. "And until it is completely exposed, and the American people utterly disgusted with its practice, it will continue unabated. At a time when ACORN could well be handed billions of dollars from the federal government, Congress must stand up protect the taxpayers." According to Bachmann, "It was reported recently that ACORN could be eligible for up to another $8.5 billion dollars." ACORN was made eligible for more than $3 billion under the $787 billion "stimulus" spending bill, and $5.5 billion from the 2010 budget. Since 1994, ACORN has received at least $53 million from American taxpayers, according to the Washington Examiner. Recently, under the "Mortgage Reform and Anti-Predatory Lending Act," the House voted, 245-176, to make the ACORN Housing Corporation (AHC) eligible for funding. "ACORN is essentially a massive crime family that has tentacles across the nation. It's involved in racketeering and it should be investigated for federal racketeering violations," said Matthew Vadum, an ACORN Investigator for the Capital Research Center. ACORN has been charged with voter fraud in 17 states including Nevada, Washington, Texas, Louisiana, New Mexico, Ohio, Michigan, Wisconsin, Indiana, Connecticut, Pennsylvania, Virginia, North Carolina, Colorado, Arkansas, Florida, and Missouri. "The obvious thing we should do is cut off those taxpayer dollars," said Sen. David Vitter (R-LA). Visit: StopAcorn.org & Contact your Senators & Representative! Tell them enough is enough - stop funding ACORN! Tags: ACORN, Americans for Limited Government, federal funding, Stop Acorn, US Congress, video, voter fraud, voter registration To share or post to your site, click on "Post Link". Please mention / link to the ARRA News Service. Thanks! by Gary Bauer: The leftwing media and blogging world are on fire today trying to blame Christians, conservatives, Fox News, Rush Limbaugh, Glenn Beck, Karl Rove, gun owners and you for yesterday’s vicious attack on the Holocaust Museum by James Wenneker Von Brunn. There’s just one problem with their story. Von Brunn was a committed neo-Nazi, and, as any student of history knows, Nazi in German means “national socialism.” The same leftwing crowd that regularly warns us not to blame Islam when an Islamofascist kills Americans or attempts to blow up a synagogue now wants to blame Christian conservatives when a national socialist Jew-hating, Christian-hating white supremacist kills a brave guard at the museum. When this horrible story broke yesterday, the first thing I did was a little online research on Von Brunn – the same kind of research any reporter should have done. I found savage rhetorical attacks on Jews – the same kind of rhetoric we regularly hear from Ahmadinejad, Hamas, Hezbollah and all the other Jew-haters that Israel is being pressured to compromise with in order to have “peace.” I also found his rantings against Christianity, the Bible and the teachings of Jesus Christ. Finally, he made it clear that he rejected capitalism and saw socialism as the only hope. In short, his views were closer to the far Left and radical Islamists than they are to Rush Limbaugh or Glenn Beck. By the way, news has just broken that the office of The Weekly Standard, under the leadership of my good friend Bill Kristol, was on a list of suspected targets found in Von Brunn’s possession at the time of his arrest. So let me summarize what we now know: Von Brunn hated Jews. He hated Christianity. He hated Fox News, The Weekly Standard and Bill Kristol. He hated capitalism and big corporations. He sounds like someone who would hang out at leftwing websites. I’ll wait to see which major news outlet blames the Huffington Post or MSNBC for this attack. The Aryan Nation and the neo-Nazi crowd are as evil as they come. And there is a great danger that these thugs will cooperate with the Islamofascists who share their hatred of Jews and America. Tags: anti-christian, anti-Israel, Gary Bauer, neo-Nazi To share or post to your site, click on "Post Link". Please mention / link to the ARRA News Service. Thanks! by Carter Clews, Americans For Limited Government: I have decided to write an open letter to the Democrat members of Congress. And I'm sharing it with you, dear reader, since it helps illustrate anew why Mark Twain called Congress "America's only truly criminal class." Remember the movie, "Planes, Trains, and Automobiles"? Starred the late, large John Candy and the always delightful Steve Martin. Well, in that movie, John and Steve (I'll call them by their real names, since throwing in their movie names at this point would only tend to confuse you), flew on an airplane, rode on a train, and rented an automobile. Hence, the name of the movie. Get it? No? Well, you can discuss it later at a town meeting. For now, here's what I want you to do . . . First of all, forget about the trains part - because what I'm about to go over with you has nothing to do with trains. I know, I know, we all like trains - and you have a special expertise with them, since you're the ones who bankrupted Amtrak. But, try to stay with me. Now what I want you to do is imagine a car with a big box on the back. And let's call this a truck. Okay? You with me? You've probably seen trucks roll past you on the highway when you're being driven around in your chauffeur-driven limousines. They often have UPS written on them. Next, I want you to think about those things that fly through the air with wings on them that you use to sneak out of town when your lobbyist friends take you on all-expense-paid political junkets (I'm sorry, I meant "fact-finding missions"). They're called "planes." Trucks roll down the road. Planes fly through the air. I'll pause here while you repeat that a couple of times until it starts to sink in . . .
Got it yet? Well, good - because if you do, there's a question I'd like to ask you: Why in god's name would you even consider passing a pay-to-play bill sponsored by a crook named Rep. James L. Oberstar (D-MN) that would gut the FedEx air delivery system by treating its fleet of airplanes like they were a bunch of trucks? Could it be because each of you - like the greedy, grasping James Oberstar - is up to your ears in political pay-offs (sorry, make that "campaign contributions") from FedEx's main competitor, United Parcel Service? And because you're also on the political payroll of the bare-knuckled bosses over at the Teamsters Union -- which has been trying unsuccessfully for years to unionize FedEx? Please, don't deny it - that would only add insult to injury. According to Bloomberg news, UPS has "given more money to federal lawmakers than any other company over two decades." And Teamster Union bosses have made a habit of handing Democrats tens of millions of dollars in hard and soft contributions in election after election for decades on end. Let's face it, you know exactly what Oberstar did - and why he did it. Carrying water for UPS and the Teamsters, he sneaked 230 words into the voluminous (I know that's a long word: it means "big") FAA Reauthorization Act that would gut FedEx. His 230-word poison pill would remove FedEx from the Railway Labor Act, under which it has operated since the day it was founded, and suddenly stick it under a law (the National Labor Relations Act) never intended for the type of air transportation FedEx uses to deliver 85 percent of its packages. And - more importantly to you, James Oberstar, and your paymasters at United Parcel Service and the Teamsters Union - it would force FedEx to unionize and end its competition with UPS (which, not so coincidentally, delivers 85 percent of its packages by truck and does rightly fall under the NLRA). In short, you have become little more than Mr. Brown's Brown Shirts. And that is nothing less than shameful. So, here's what I want you to do if you have one ounce of decency left (and, please, write this down, or ask one of your factotum aides to remind you): Strip the Oberstar pay-to-play poison pill language from the FAA Reauthorization Act in the Senate. And, then, just for good measure, make sure that hack Oberstar doesn't try to stick it back in when the bill goes back to the House. It might help you sleep better at night. Or, if not, at least it will for the rest of us. Once you're done all of that, you can get back to bankrupting the nation, which I know is your favorite thing to do anyway. That's a pretty ugly story, isn't it, dear reader? And it's made all the uglier because it is absolutely 100% true. The United States Congress, in its continuing assault upon free enterprise, is preparing to dismantle FedEx at the behest of the UPS contributors and Teamster Union bosses. FedEx calls it a "bailout" (brownbailout.com). I call it a sell-out - because Mr. Brown's Brown Shirts are preparing to sell your birthright of freedom for their pot of political porridge. Feel free to drop them the above letter if you get the urge. Maybe they might even listen. Tags: Americans for Limited Government, bailout, congress, FedEx, union bailouts, UPS To share or post to your site, click on "Post Link". Please mention / link to the ARRA News Service. Thanks! Tags: angry taxpayers, IMF, International Monetary Fund, political cartoon, taxpayers, Timothy Geithner, William Warren To share or post to your site, click on "Post Link". Please mention / link to the ARRA News Service. Thanks! Yesterday, the Senate voted 67-30 to invoke cloture on FDA tobacco regulation bill, H.R. 1256 and will vote this afternoon on the bill. Government Run Health Care: The first cracks in the dam holding back opposition to Democrats’ plans for a government-run health plan are becoming apparent today, and Democrats are showing signs of panic. The Problem: There is little disagreement that the current health care system needs an overhaul. Today, health care costs continue to rise while people have fewer choices and are less secure that the coverage they have today will be there tomorrow. However, President Obama and leaders in the Congress think the solution is to expand government’s control over health care. Proposals like a new public plan, a federal exchange and health board, and even mandates on employers and individuals to offer or buy government-approved package of benefits, are all intended to give more power to Washington over the financing and delivery of health care. The end result could jeopardize the private coverage Americans have today, limit their health care choices, and cost taxpayers more. The Solution: Instead of a putting Washington in control over personal health care decisions, individuals and families should be the key decision makers in their health care. Proposals that give fair and equal tax treatment for those who buy health coverage on their own, encourage states to develop solutions that will give individuals direct control of the flow of health care dollars, and finance reform by restructuring existing spending, not more spending, are key steps to solving America’s health care problems. Such a system would promote personal ownership; give Americans more health choices, and force health plans and providers to compete directly for their dollars. The end result would lower costs and guarantee better quality. On June 9th, Rep. Paul Ryan (R-WI) and Bob Moffit, director of Heritage’s Center for Health Policy Studies, spoke to more than 1,300 concerned citizens about the future of health care in America. Click to listen to a recording of the teleconference. Tags: FDA, health care, Max Baucus, nationalized health care, Paul Ryan, The Heritage Foundation, tobacco products, US Congress, US House, US Senate, Washington D.C. To share or post to your site, click on "Post Link". Please mention / link to the ARRA News Service. Thanks! Is Abdulhakim Muhammad a prime example of a Muslim convert who sees America as a Nation at war with Islam rather than against people who are enemies of America which also happen to be Muslim? Or is he an exception to the prevailing view of Muslims? In this case, a Muslim American is not persuaded that his shooting of two unarmed America soldier was wrong or that his killing one of them is murder. He believes he was justified.
. . . Muhammad told the AP he admitted to his actions to police and said he was retaliating against the U.S. military. "Yes, I did tell the police upon my arrest that this was an act of retaliation, and not a reaction on the soldiers personally," Muhammad said. He called it "a act, for the sake of God, for the sake of Allah, the Lord of all the world, and also a retaliation on U.S. military." In the interview, Muhammad also disputed his lawyer's claim that he had been "radicalized" in a Yemeni prison and said fellow prisoners that some call terrorists were actually "very good Muslim brothers." He also said he didn't specifically plan the shootings that morning. "It's been on my mind for awhile. It wasn't nothing planned really. It was just the heat of the moment, you know," said Muhammad . . . . said he wanted revenge for claims that American military personnel had desecrated copies of the Quran and killed or raped Muslims. "For this reason, no Muslim, male or female, sane or insane, little, big, small, old can accept or tolerate," he said. . . .
Texas Fred rightly noted on his site: "[Barack] Obama was "shocked and outraged" at the murder of an abortionist, but wasn’t shocked and outraged by the murder of a U.S. soldier, and the shooting of another soldier, on duty, at a recruiting station on American soil, a shooting and murder that was committed by a member of the Muslim cult that we, supposedly, aren’t at war with? Isn’t the murder of this soldier a heinous act of violence as well? If you’re Barack Hussein Obama, apparently not…"
What kind of confusion is being peddled by our political leaders? Now that Obama has announced that GITMO will no longer exist, how many others will attack American military personnel and their families? Will Obama administration via AG Holder take jurisdiction over this murder case to shut down the publicity and to protect Abdulhakim Muhammad from the Arkansas' death penalty? Tags: Arkansas, Little Rock, Murder, Muslim, Soldiers, terrorists To share or post to your site, click on "Post Link". Please mention / link to the ARRA News Service. Thanks! Former Speaker of the House Newt Gingrich delivered the keynote speech at the 2009 GOP Congressional Dinner. Tags: 2009, fundraiser, GOP, Newt Gingrich, principle, RNCC, RNSC To share or post to your site, click on "Post Link". Please mention / link to the ARRA News Service. Thanks! Government Motors presents . . .
Government Motors presents the Chrysler Genericus! A look at the future of Chrysler, and GM, and your future options as a car buyer. If I were you, I'd change oil regularly and keep the old jalopy maintained. Revised: President Obama Government Motors Commercial - President Barack Obama becomes the national sales spokesman for Government Motors. Would you buy a car off this guy? Tags: Barack Obama, car dealer, Chrysler, GM, Government Motors, news, political satire, Politics To share or post to your site, click on "Post Link". Please mention / link to the ARRA News Service. Thanks! Yesterday, by a vote of 36-60, the Senate rejected an alternative substitute amendment to the tobacco regulation bill from Sens. Richard Burr (R-NC) and Kay Hagan (D-NC). Senate is scheduled to vote on cloture on H.R. 1256. Car Czar Award: Senator Lamar Alexander (R-TN), Chairman of the Senate Republican Conference, held a special blogger conference this morning to discuss his “Auto Stock for Every Taxpayer Act” and his “Car Czar” award. Sen. Alexander believes that rather than the government owning stock in GM and Chrysler, taxpayers should own that stock, since they put up the money to rescue those companies. Sen. Alexander said, “This is the fastest way to get the stock out of the hands of Washington and back into the hands of the American people in the marketplace where it belongs. . . You Paid for It! You Should Own It!” On Monday, Sen. Alexander presented his first car czar award to Rep. Barney Frank (D-Mass.) for interfering in the operation of General Motors. Why are Democrats in such a hurry? Senators had 55 days to review then-Judge John Roberts’ cases prior to his confirmation hearing in 2005 and 70 days to review all of then-Judge Samuel Alito’s cases. Yet Leahy is giving senators only 48 days to review Judge Sotomayor’s 3,625 cases, which would mean having to consider 76 cases per day, compared with 6 cases per day for the Roberts hearings. Sen. McConnell noted this morning that Democrats “wanted time to review the record” of Republican nominees, but “when it comes to a Democrat nominee . . . They want the shortest confirmation timeline in recent memory for someone with the longest judicial record in recent memory.” Democrats would do well to reconsider their partisan rush and return to how they wanted to do things the last time the Senate considered Supreme Court nominations. They appear to believe that they must get everything their way as fast as they can because they see no tomorrows if they don't. With their continued abuse of power, the people of America may well give them their wish of no tomorrows and the Republicans / Conservatives may not be so kind the next time they are in the majority. Tags: Car Czar, Lemar Alexander, nominee, SCOTUS, Supreme Court, tobacco, US Congress, US Senate, Washington D.C. To share or post to your site, click on "Post Link". Please mention / link to the ARRA News Service. Thanks! [ARRA Editor Comment: The following person is understandably so frustrated that he plans to leave the U.S. As for me, I plan to stay and to work for our rights - all of them!] by Curtis R. Pack: The Supreme Court just approved King OBAMA’S re-engineering of U.S. Bankruptcy law. For the last 238 years we had a fair and just set of rules that governed bankruptcy proceedings. A secured Bond holder which is defined as the investor who had loaned money secured by the assets of the borrower (in this case Chrysler) would be first in line in a bankruptcy. This is based on property rights, the person with the most rights based on property would be the most secured. The second in line would be unsecured Bond holders, the third in line would be share holders, and all other creditors would then be sorted out by the court. This bankruptcy was turned upside down so that a criminal President could reward his friends "the Labor Unions." Who had the least amount of property rights to be moved to the top. We now live in a country where the three branches of government have proven to the American people that we have now been deprived of the most precious guarantee in the Constitution, the pursuit of happiness, which was the guarantee to the fruits of our labor, property. Property was the foundation of our nation it was the peoples check on government power. But, it has been eroded over time. The first assault on property was the Income Tax. The income tax effectively removed our property rights by instituting a direct tax on property and gave the federal government the first position on property rights, money is not only property, It is the basis for all of the property we acquire. The IRS over the last century has removed property rights through seizures of property and the violation of due process. "No man is more enslaved than he who falsely believes himself to be free" (Goethe). This is the first time in the history of the Supreme Court that they have ruled against our Constitutional right to property. The court has looked the other way regarding the IRS and other property rights violations, but this is the first time they have given it a stamp of approval. People this is the most egregious ruling in the history of the court, they have just ruled this a communist country and have given a green light to whatever type of Socialism or Fascism the government may choose for us. I now know how Patrick Henry felt, when in frustration he rose to his feet and with anger to his countrymen declared "give me liberty or give me death." We have become a nation of self indulgent cowards who do not have any appreciation for the sacrifices that so many before have made in order to secure the greatest nation on earth and the liberty it guaranteed, well that nation no longer exists. We live in a nation where a majority of our population wants to be cared for like feedlot cattle. I have never been so outraged at the people of this country more than now. We are watching a man that is not constitutionally eligible to Serve as President turn our country into a fascist banana republic and all I hear is "what's in it for me." I am leaving America and moving to Costa Rica. If there comes a day when the people of this country grow a backbone, I will come back and do my part. It is a sad day when you have to move out of America to live in a free country one that still respects your property and other god given rights. I will sum this up one more time. The Supreme Court just removed the one provision of the constitution that secured all of the other guarantees of the Constitution "property." I will leave a final thought and will let Samuel Adams speak for me: "If ye love wealth greater than liberty, the tranquility of servitude greater than the animating contest for freedom. go home from us in peace. We seek not your counsel, nor arms. Crouch down and lick the hand that feeds you; may your chains set lightly upon you, and may posterity forget that ye were our countrymen." You can forget the part about wealth. Tags: bankruptcy, Barack Obama, property rights, SCOTUS, US Supreme Court To share or post to your site, click on "Post Link". Please mention / link to the ARRA News Service. Thanks! Mr. President & Congress: How are you helping us? 1. You don’t allow healthy free-market competition to take place. Instead, you set up quasi-gov’t-owned entities that alter the markets. You give special treatment to corporations that kills off healthy competition and wrecks our economy. Then you bail out mega corporations that have somehow become too big to fail at taxpayer expense. 2. You don’t allow us to be energy independent. We have abundant resources in our own country with the biggest obstacle being government support. 3. You don’t allow our nation to be competitive globally. You insist on promoting unions which foster inefficiency and mediocrity vs. efficiency, agility, and excellence. You insist on taxing productivity when taxing consumption (i.e. the FairTax) will repatriate business opportunity, capital, jobs, and prosperity back to our lands. 4. You don’t control spending. You burden current and future generations with massive debt which will ultimately break the back of America. 5. You don’t control immigration. You are giving rights to those not here legally AT TAXPAYERS’ EXPENSE. It seems that expanding the voter base is more important to you than the security and economic prosperity of those already here. 6. You don’t foster educational excellence in K-12. Competition is the only way to promote excellence and you have taken it away from our school system as well. The result of all of this? An economy in shambles, loss of our competitive edge, a country that consumes but no longer produces, a massive trade imbalance, massive debt, and diminishing hope for current and future generations. If your goal is to unravel everything that is good here in America you are doing a great job! YOU are the man behind the curtain with all of the levers, dials, knobs, controls, switches, etc. and YOU are messing our country up! Why? Why are you doing this? If you truly care about our country will you please stop the nonsense? Senate resumes consideration of the FDA tobacco regulation bill, H.R. 1256. Yesterday, the Senate finally voted 61-30 to invoke cloture on the Dodd substitute amendment to H.R. 1256. The Senate will vote today on an alternative substitute amendment to the tobacco regulation bill from Sens. Richard Burr (R-NC) and Kay Hagan (D-NC). GITMO: Last week, President Barack Obama choose to speak to the religious followers of Islam as Barack Huessein Obama declaring his Muslim roots in a speech in Cairo to 1.5 billion Muslims of the world. He did that while having previously denied that his own country was a Christian country. He choose to speak to the followers of a religion as if it were a country and to begin to negotiate verbally with that religion. Knowing that the Senate had voted overwhelmingly to ban using any federal funds by any federal agency to to move GITMO detainees to the U.S. for release, for trial or for detention, he declared to the Muslim world, as if they should be deferred to as a nation, that he would close GITMO. Now the AP reports this morning, “U.S. authorities have brought the first Guantanamo Bay detainee to the United States, flying him into New York to face trial for bombing U.S. embassies, the Justice Department said Tuesday.” Ahmed Ghailani, accused of helping build one of the bombs that blew up the American embassies in Tanzania and Kenya in 1998, is now being held in Manhattan, as the Justice Department prepares for a trial. This action by the Obama administration ignores the Senate’s recent 90-6 vote to deny ('ban") funding “to transfer, release, or incarcerate any individual who was detained as of May 19, 2009, at Naval Station, Guantanamo Bay, Cuba, to or within the United States.” Of course, Democrats in Congress have yet to finish work on the bill this provision is attached to, the fiscal year 2009 supplemental appropriations bill. And part of the reason they have not finished work on the bill is because they are being pressured by the White House to allow funding for moving detainees to the U.S. for incarceration or trial. But there is strong bipartisan opposition to such a move. Asked at a May 19th press conference if he would be okay with Guantanamo detainees being transferred to an American prison, Senate Majority Leader Harry Reid said, “Not in the United States.” Was moving Ghailani to New York City an attempt to present a fait accompli to Congress and pre-empt the Senate’s action? Indeed, previous trials in U.S. federal court have inadvertently aided terrorists, by tipping them off to intelligence methods, leaking of sensitive material, and even lawyers smuggling orders to terrorists. Further, as Sen. McConnell explained in a May floor speech, “It’s one thing to transfer one or two terrorists — disruptive as that may be. It’s quite another to transfer 50-100, or more, as Secretary Gates has said would be involved in any transfer from Guantanamo.” Sen. Sam Brownback (R-KS) told bloggers last week that part of the problem of brining dangerous Guantanamo detainees to the U.S. “isn’t about keeping them in, it’s about keeping other terrorists out.” Facilities holding detainees would become prime targets for terrorist attacks. Tags: FDA tobacco regulation bill, GITMO, US Congress, US Senate, Washington D.C. Barack Obama, Muslim roots, Cairo, Egypt To share or post to your site, click on "Post Link". Please mention / link to the ARRA News Service. Thanks! Today in Washington D. C. - June 8, 2009 - Where are the jobs? Note: This is an update on news and comments by Washington sources on June 8th. ARRA News did not posting additional info as editor was traveling. Politico reports that, “President Barack Obama is announcing Monday that he is ramping up stimulus spending exponentially in the next three months, allowing the administration to ‘save or create’ 600,000 jobs — four times as many as during the first 100 days since he signed the bill.” It’s important to keep a few things in mind as the president touts his $787 billion stimulus bill today: no one has been able to figure out how one measures jobs “saved or created,” let alone verify the White House’s numbers; Obama and Democrats sold the stimulus saying that unemployment would have leveled off by now, though it continues to increase; and Americans are souring on the deficit spending the administration has used for the stimulus and other programs, according to a new Gallup poll. Back in April, the Obama administration was claiming that the stimulus bill had “already saved or created over 150,000 jobs.” Where are they! Fackcheck.org wrote at the time, “It turns out the president’s claim is really an estimate of what his economic advisers think the stimulus bill is doing, and not based on any evidence of its actual effects.” Can we expect similarly rigorous measurement of the goal of 600,000 jobs Obama wants to “save or create” over the summer? In the process of trying to get Congress to pass a bill that added over $1 trillion to the national debt (when interest payments are included), Democrats in Congress and the administration relied on a report from White House economic advisor Christina Romer that unemployment would level off by now, at around 8%, and would start going down in the second half of 2009 if the stimulus passed. But according to the Bureau of Labor Statistics, more than 2.9 million jobs have been lost this year and unemployment has continued to rise to 9.4%. The Romer report’s claims were illustrated in a now-famous graph showing where the unemployment rate would supposedly be without the stimulus bill compared with where it would be with the bill. Bloggers have taken the liberty of graphing the actual unemployment data on this chart, and Fausta has the latest iteration in a post today, showing that the unemployment rate is far above where the administration said it would be with the stimulus bill. Meanwhile, Americans are showing their skepticism on the unprecedented amount of deficit spending that President Obama has used things like the stimulus bill. Politico writes, “For the first time, a majority of respondents disapprove of Obama on the issue of ‘controlling federal spending’ (51% to 45%),” according to a new Gallup poll. 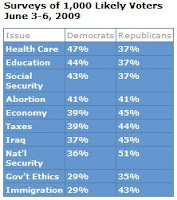 Further, a plurality, 48%, disapprove of his handling of the deficit. Tags: jobs, Gallup poll,Obama, stimulus bill, Where ar the Jobs, US Congress, US House, US Senate, Washington D.C. To share or post to your site, click on "Post Link". Please mention / link to the ARRA News Service. Thanks! by Phyllis Schlafly, Eagle Forum: The younger generation probably doesn't realize that the word Socialism means and connotes a system that is profoundly un-American. Socialism has virtually disappeared from our national lexicon since the Union of Soviet Socialist Republics (USSR) collapsed because of Ronald Reagan's policies, and the National Socialist (Nazi) Party was destroyed by the U.S. in World War II. The American Heritage Dictionary defines Socialism as a system of social organization in which the means of producing and distributing goods are owned by a centralized government that plans and controls the economy. Both Webster and Random House identify Socialism as a "Marxist theory." Socialism requires a totalitarian system; that gives the ruling gang the power to distribute the fruits of other people's labor to its political pals. That is what is happening to the United States as President Obama proceeds with his goal of "remaking America." Although the pro-Obama media have been propping up non-Republicans to lecture us about which topics Republicans are permitted to discuss, we are reminded of the old story about the candidate who challenged his opponent: "Let's have a clean campaign; if you don't tell any lies about me, I won't tell the truth about you." Obama acolytes and their media sycophants have been telling lies about Republicans (starting with Gitmo and the CIA), so it's time for Republicans to tell the truth about Obama's dangerous and malicious Marxist policies to spread the wealth of taxpayers to non-taxpayers. The RNC charges the Democratic Party with passing "trillions of dollars in new government spending, all with strings attached in order to control nearly every aspect of American life," "plans to nationalize the banking, financial and healthcare industries," "massive government bailouts for the mortgage and auto industries," and "paying states to increase their welfare caseloads" by reducing work requirements and increasing handouts. Another Whereas accuses the Democratic Party of "direct income redistribution" by taking taxes from one group of people and giving "direct cash transfers to another group of people who pay no federal income taxes." The RNC accurately accuses the Democratic Party of taking us in a "European direction," a path the American people have no desire to travel. The RNC, which is the governing body of the Republican Party, has helpfully spelled out the differences between the two political parties. The "clear and obvious purpose" of the Democratic majority in Congress is to implement "Socialist programs through federal legislation" and to restructure American society "along Socialist ideals." Do the Republicans have an alternate vision of America's future? You bet they do. The Republicans recognize that free markets and free men, hard work and free enterprise, are the bedrock of American success and the only way to restore prosperity. Unable to defend the march toward Socialism, Treasury Secretary Geithner just told the Washington Post that the RNC resolution is "ridiculous." Now we can see the icing on the cake for the politicians who use economic dictatorship to punish those who resist Socialist planners. Nearly every one of the closed local dealerships had donated to Republican candidates, almost none was an Obama contributor, and some dealerships owned by Democrats are not getting the ax. These closings come after Obama's extraordinary cash and stock favoritism to one of his principal campaign supporters, the United Auto Workers union. The Car Czar, Steve Rattner, was a top Democratic fundraiser (surprise, surprise!). Obama seems to be captivated by the un-American notion of running the country through Russian-style czars empowered to issue czarist-style ukases. He has already named about 20 czars (more than the Russians had over four centuries), and his latest is a Cyber Czar. This year's deficit will be $1.841 trillion — $89 billion more than previously estimated. It's so difficult to explain to the American people the gigantic dimensions of what Obama is doing that we are suffering from what has been labeled "insensitivity to scope." We hope the RNC resolution will clarify Obama's goals and actions. Tags: America, Phyllis Schlafly, socialism To share or post to your site, click on "Post Link". Please mention / link to the ARRA News Service. Thanks! Competitive Enterprise Institute: Federal regulations impose a whopping $1.17 trillion last year in compliance burdens on Americans, finds a new report from the Competitive Enterprise Institute. That amounts to $3,849 for each man, woman, and child in America. The Federal Register, the depository of all rules, stands at a record-high 79,435 pages. “The U.S. economy lost value in 2008 for the first time since 1990. Meanwhile, our federal government imposed a $1.17 trillion ‘hidden tax’ on Americans beyond the $3 trillion officially budgeted,” said Wayne Crews, author of Ten Thousand Commandments: An Annual Snapshot of the Federal Regulatory State. Federal agencies issued 3,830 rules in 2008. “The costs of federal regulations too often exceed the benefits, yet these same regulations receive little official scrutiny from Congress,” said Crews. The report urges Congress to step up and take responsibility as lawmakers to review and roll back economically harmful regulations. “Rolling back regulations would constitute the de-regulatory stimulus that the U.S. economy needs,” said Crews. Federal regulations ate practically 10 percent of what the U.S. economy produced last year. If the regulatory state were a country, it would have world’s 15th highest GDP. Think you pay a lot in income tax? At $1.172 trillion, regulation approaches the level of 2008 individual income taxes of $1.2 trillion. Regulatory costs are equivalent to 65 percent of 2006 American corporate pretax profits combined, of $1.8 trillion. Regulatory costs are a huge hidden tax. Consider that the federal government spent $2.98 trillion in 2008, and businesses spent over a third of that amount on regulatory costs. Together, that’s over $4 trillion taken away by government from the sector of the economy that actually creates jobs and provides economic opportunity. The biggest regulations got bigger. “Economically significant” regulations – new rules that cost at least $100 million—increased by 13 percent between 2007 and 2008. The report urges reforms to make the regulatory costs more transparent and accountable to the people, including annual “report cards” on regulatory costs and benefits, and congressional votes on significant agency rules before they become binding. » Read the report. Tags: CEI, Competitive Enterprise Institute, Federal Regualtions, taxes To share or post to your site, click on "Post Link". Please mention / link to the ARRA News Service. Thanks!